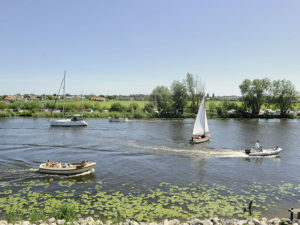 Bed & Breakfast ‘Als het golft’ stands proudly on the banks at the point where three waterways converge. Firmly grounded in the dike, this smartly designed waterfront home is a wonderful, comfortable place to stay. The stylishly furnished rooms and green outdoor terrace offer fantastic views over the traditional Dutch polder landscape stretching out behind the house, and the water that never rests.